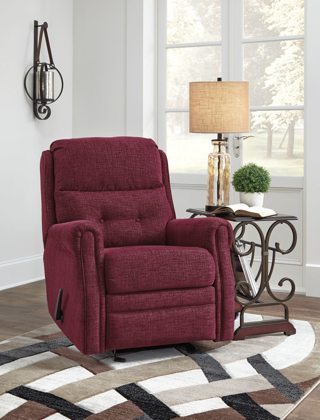 The chenille-textured Penzberg recliner grants you the resting power you deserve. Refined sizing saves space without sacrificing comfort. With just one pull, it reclines to the position of your liking. And talk about style. Gorgeous burgundy hue is accompanied by slim arms and button tufting on the lumbar cushion.